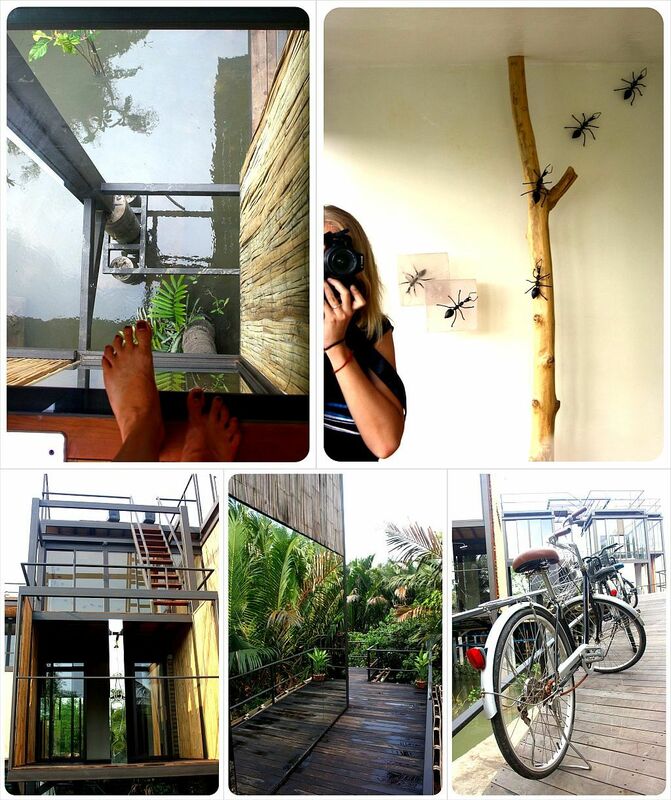 We were recently invited for a sneak peek of the brand new Bangkok Tree House hotel on the banks of the Chao Phraya River, just beyond Bangkok’s city limit. We were super stoked about this opportunity, because a) there aren’t many tree house hotels in the world, b) we certainly never stayed in one and c) we both love hotels that aren’t your regularly chain hotel and incorporate innovative ideas and designs. What we found was an eco-masterpiece in the works, conceived by the son of a Bangkok hotelier now very much a world-class hotelier himself! After a 30 minute ride on the Skytrain from central Bangkok and a 15 minute cab ride, we arrive to the pier next to the Bangna Nok temple and followed the instructions to call the manager of the Bangkok Tree House and he and the captain of the tiny speedboat arrive in two minutes. The manager is dressed to impress in all black, bringing the aura of luxury with him to this otherwise grubby pier. We load into the boat and are whisked across the river, and in three minutes pull up at simple bamboo pier overlooked by the hotel’s organic restaurant. As we carefully, perhaps clumsily, disembark, an older local man observes us from the comfort of his wooden fishing boat. His boat is just a few feet from the one of the twelve modern tree house suites behind him, and the contrast between his leathery, wrinkled skin and well-worn fishing boat to the gleaming glass of this modern abode strikes me as relevant. This is the first hotel built on the river in this area of Bang Nampheung, which feels like an entirely different world to the jam-packed chaos, consumption and capitalism just over the river in Bangkok. We meet the owner Joey Tulyanond in the restaurant, which is temporarily serving as the hotel reception. Joey’s impeccable English reveals time spent abroad working in Washington, DC. This was before returning to Thailand to open the Bangkok Tree House, an extreme departure from the traditional Thai style of his family’s Old Bangkok Inn in central Bangkok (click the link to see our review of the hotel). What the two hotels do have in common is a strong adherence to a green policy, but Joey has taken this to an entirely different level. First, the hotel is entirely carbon neutral, and promises to collect a kilo of trash in the area for every booking to the hotel. As we tour the property, we see the space where the pool will go in. The plan is to create a natural pool, which uses plant life to clean and regulate water quality, without using chemicals like chlorine. The pool, along with the entirely organic restaurant, should be up and running by late February, Joey explains as he escorts us to our bungalow. 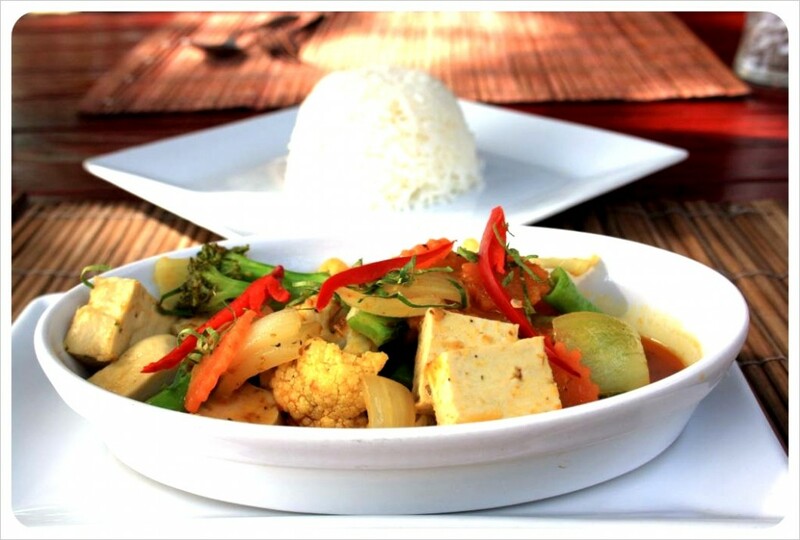 There will be three set menus available – one Thai option, one seafood and one vegan, all set at 490 baht. For now, only the delicious breakfast (included in room rate) is served here, he apologizes, sliding the door open to the tree house. The bungalows are set over three levels. 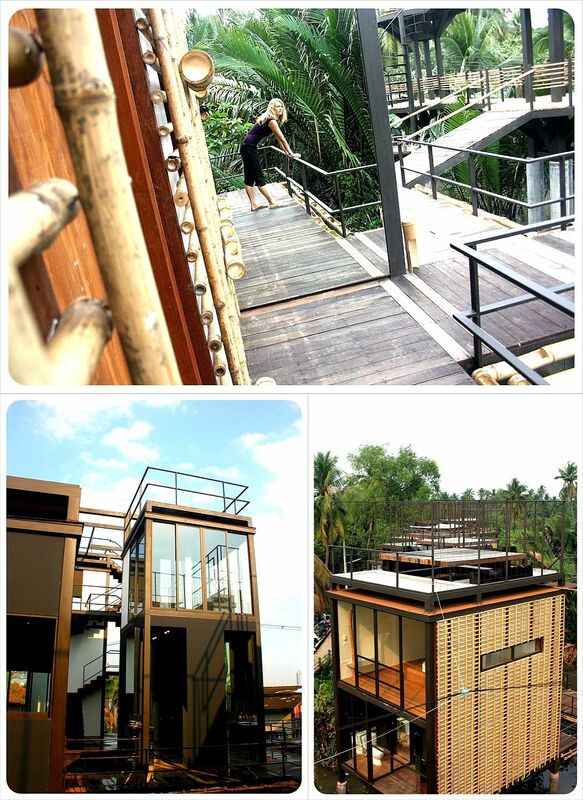 We enter on the ground level which is essentially a large bathroom with a toilet nook (complete with glass floor looking down onto the river) and a gorgeous outdoor rain shower (and a second shower) on the bamboo deck, made private by an unrolled, heavy bamboo curtain. Upstairs, we see why our room is called the Ant room: there are giant 8-inch ants traipsing across the wall and the strikingly familiar wooden IKEA furniture inside. Each room is equipped with 32 inch computer monitor stocked up with hundreds of movies, documentaries and music to watch and play during our stay. The outdoor patio on this floor overlooks miles of mango trees, which are fun to look at from the comfort of the bed. Upstairs on the roof are two sun beds perfect for sunbathing. On hot days there might be nothing better than going down to the communal refrigerator (rather than one in every room, this communal fridge saves energy) on the ground floor and grabbing some of that bottomless ice-cream – one of Joey’s more creative (and tasty!) hotel policies. Running up and down the stairs to get that ice cream, however, requires full concentration, thanks to the architectural style that keeps the tree house feel at the forefront of our awareness. We start the morning by watching the waves of the river lap at the bank below our hut, thanks to the glass floor beneath the toilet in the bedroom. At the top of a set of staggered steps, there is a second pane of glass in the floor through which we see the river as well. Ascending to the roof requires stepping safely onto a piece of tarp that covers the shower space and below, and then swinging up onto a ladder and climbing that up to the roof. The warm rain shower requires us to even undertake some of our very personal business outdoors – and we love this as much as we did on the island of Koh Lanta. In fact, all of this in no way inhibits the relaxing effect or luxurious feel of the hotel, and it is actually quite satisfying to ‘climb’ up to the safety of our nest for the night. As for filling the days, the Bangkok Tree House is not ideal for power shoppers focused on deals in central Bangkok. Guests are better off staying out here, renting (for free) the fashionably rusty bikes to explore. In fact, if you do not do cycle here, you are wasting your stay at the Bangkok Tree House. The area surrounding the hotel, where the river meets the land, forms miles of lush green swampland, conquered by the locals by creating raised cement sidewalks that snake in and around amphibious neighborhoods of houses on very low land. The pathways all eventually connect up to larger roads with plenty of roadside restaurants (keep your eyes open for a fantastic coffee shop called Coffee Professionals on one of the main roads). We lost ourselves in here for an hour or so, stumbling upon the Herbal Joss Stick house, privately run by an adorable husband-wife duo who immediately welcomed us and gave us a tour of the center. Also their family house, the wife hand makes herbal joss sticks, which are like incense to ward off mosquitos, and runs Thai cooking classes, while the husband does cycling tours through the area in his down time from teaching at a Bangkok university. You won’t find them online anywhere, however, (our limited language skills kept us from understanding how they host all these tourists), and the entire Bang Nampheung area feels almost completely undiscovered, save for the newly created Bang Nampheung floating market. Initially, we thought that the location of the Bangkok Tree House would be an inconvenience, and too far from central Bangkok to attract enough guests. On the contrary, the location of the hotel is by far one of its most attractive features. At night, we felt safe all tucked up in our tree house watching movies looking out into the jungle on the river, and during the day we were some of the very few foreigners riding around typically Thai streets, quite a feat in Thailand, a country where almost everywhere panders to tourism. We felt entirely local, and yet good and pampered back at the hotel – the perfect combination for a relaxing escape anywhere. Inside our tree house at night, the lights bounce off the glass and mirrors in a way that create those endless tunnels of reflected scenes, leaving us feeling in a sort of dreamworld, and then climbing up the staggered steps and watching the ebb and flow of the water below creates an atmosphere that make this an entirely unique Bangkok hotel. Although the local architect Nuntapong Yindeekhun is nearly as off the grid as this hotel is (he is looking to leave architecture and get more serious about eco-farming!) his design is intelligent and modern, using natural and recycled materials wherever possible and creating a perfect balance of an awareness of nature with luxury. As of this review, the hotel was still entirely under construction, so we can’t go naming something to improve upon. We did develop a laundry list of concerns, however. This might include a bit more training for the staff, who are very friendly but still a bit awkward dealing with guests. The ‘ground’ floor of the bungalow gets extremely hot as there are no windows, just sliding glass doors, which, due to mosquitoes won’t be opened after dusk. A fan would be a welcome touch. Joey plans on selling green products in the new reception area, and we hope this includes the joss sticks from the Herbal Joss Stick house, both for the mosquitoes and to support local businesses. We hope that the wi-fi reaches the bungalows, as promised on the website. Wi-fi was only available in the restaurant (and minimally at that) during our visit. Finally, not because of any extra large fish in the river, but for the flocks of new guests, this hotel is gonna need a bigger boat than its current little four-seater speedboat. Bangkok is home to over 800 hotels – the budget cheapies of Khao San Road, comfortable mid-range hotels and uber-luxurious five-star properties reserved for the world’s elite…and then there is the Bangkok Tree House in a category and class of its own. There is enough luxury to deserve the $150 minimum price tag, but enough peace and quiet to marvel at its actual proximity to the buzz of central Bangkok. 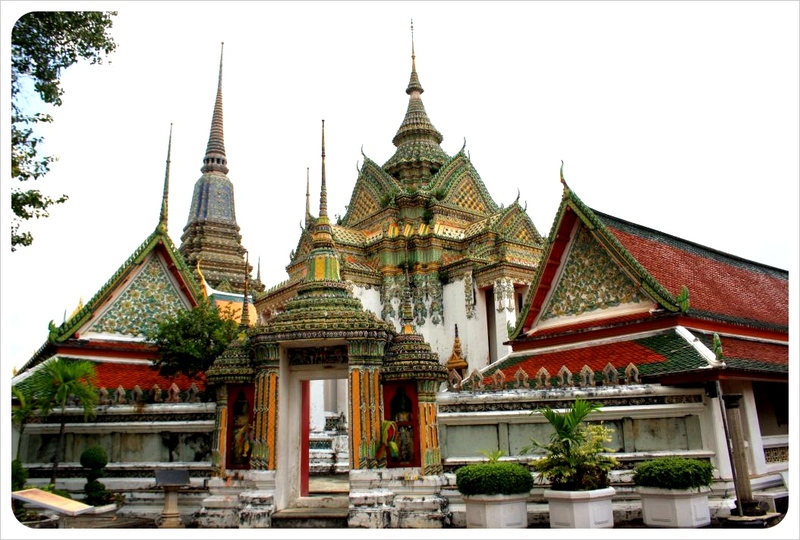 There is certainly not a lack of Bangkok hotels but finding the right one at the right price may be more difficult. By doing research not only are you narrowing your hotel options but you are also creating a budget that works for you. If Bangkok is the city you are destine to visit, make sure to check out an exotic hotel such as the Bangkok Tree House Hotel. With Thailand’s amazing beauty and increasing modern appeal it is no wonder why so many tourists visit year after year. Welcome to our Hotel Tip of The Week series. Being on the road every day of the year means we stay in countless hotels, and at over 600 days as nomads, we have stayed some of the best (and worst) accommodation the world has to offer. We cover everything from budget to luxury accommodation, and believe that any hotel worth recommending must be comfortable and clean, offer good value for money and treat people as guests, not clients. We have personally stayed in every hotel we recommend to you here on Globetrottergirls.com. I haven’t even taken my bag from the trunk of the taxi yet, and already there is a woman behind me who wants to take it for me. ‘You stay at this hotel, here, with us?’ she asks. ‘Yes, yes we are staying here,’ I say with a surprised smile. 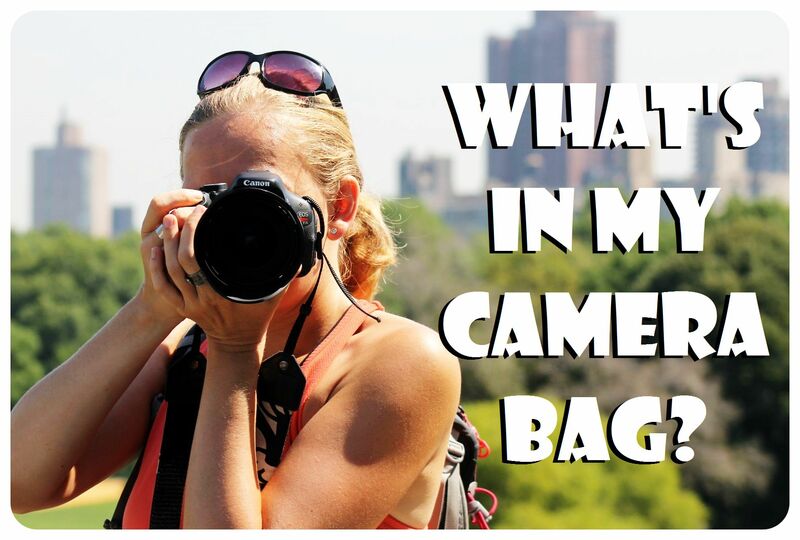 I want to continue by saying… but my bag weighs more than you do, you adorably tiny Thai lady, but instead I just say ‘Don’t worry, I’ll bring the bag inside’. Dani does the same, and we pass under Spanish moss and hanging plants that decorate this small part of an otherwise busy side street on our way inside the Old Bangkok Inn. As the name suggests, we are staying at a small, cozy typically Thai Inn (just getting our big western bodies and backpacks through the two slim dark wooden front doors is a challenge) and from the minute we walk in, I am sure we are going to love the place. There is no lobby, just six or seven round wooden tables, antique sofas and an eclectic mix of traditional Thai knick knacks and paintings. The room is bright, thanks to two picture windows on either side of the door, and we sit down while we check in, sipping the cool glass of sweet tea customary at most quality Thai hotels. Outside, motorcycles buzz by like bees, buses with squealing brakes stop just out front and the bright pink or yellow taxis whiz by on their way to drop off or pick up a fare. Almost entirely silent, just enough noise comes through to remind us how quiet it actually is, just a few feet from Bangkok’s constant chaos outside, forming the undertones below comfortable classical music pumped in nonchalantly at a level high enough to enjoy, and easy enough to ignore. Our room is through another set of slim wooden doors and up the stairs, and there are three similar rooms upstairs and four on the ground floor. Immediately I am struck by the fact that the room has two single beds (an issue we are constantly going through as most hotels see us as two friends, not as a couple), the typical Thai decor and the low hanging antique-looking candelabra chandeliers, one between the bed, the other hanging over a third mattress/couch on the floor, which is right below a set of large double windows. A computer monitor on an antique desk unit at the head of the beds serves as a TV and computer – there is broadband internet on the computer, but no wi-fi. The weekly weather forecast is tucked in right by the three remote controls (TV, DVD and Air-Con), so that it can’t be missed. The bathroom is lovely, with a pedestal sink, the shower has organic body soap and shampoo in gorgeous ceramic containers, and there is also an adorable pillow with thread and needles, an original spin on the standard hotel room sewing kit that makes us want to have an excuse to sew something. The reason we were interested in the Old Bangkok Inn initially was for the hotel’s eco-friendly policies, which were plain to see throughout the room. As part of the Texas based Green Hotels scheme, the hotel has put eco-friendly policies into place. For example, water comes in a large glass serving vase with a note explaining just how many gallons of oil are used to produce plastic water bottles each year. Toiletries are in re-usable bottles, and towels are requested to be hung up unless we want to have them washed. Warning: this next part is nitpicky, but there are two tiny details in the room I really appreciate. First, there are hooks everywhere: five in the bathroom and a few on the walls throughout the room. Second, there are light switches everywhere, so that I don’t have to shut off the lights and night and stumble back into bed, or wake up entirely in the dark. Both of these things might seem small, but it means that thought has actually been given to the guest experience – not just the decor, the design, and the end profit. On the downside, the regular rooms feel a bit small. For a higher nightly rate, there are two incredible suites at the Old Bangkok Inn which afford guests a much more regal experience. We are able to peek into the Lotus suite the next morning – the Honeymoon suite was booked. 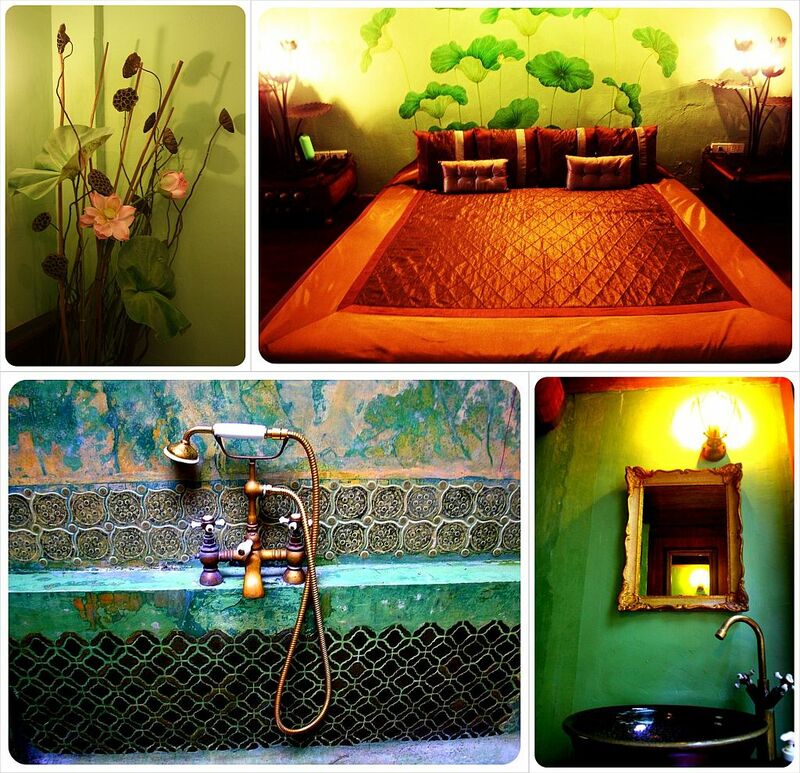 The suites have large double beds set in the middle of spacious, intricately decorated room. A walkway through to the huge, tiled outdoor bathtub also serves as a luxurious indoor/outdoor shower experience. Up a small flight of stairs is a lofted second ‘bedroom’ of sorts, making this suite perfect for families with children. The Old Bangkok Inn has plenty of great features that stand out, but overall it was the execution of the theme from start to finish. The look and feel, with wooden paneling, antique furniture, beautiful Thai paintings, allows guests to really soak up a traditional side of Thailand that is hard to come by in the metropolis that is Bangkok, in addition to providing a truly peaceful escape from the noise outside. One specific Stand Out feature of the hotel is the breakfast, which was simple and truly delightful. 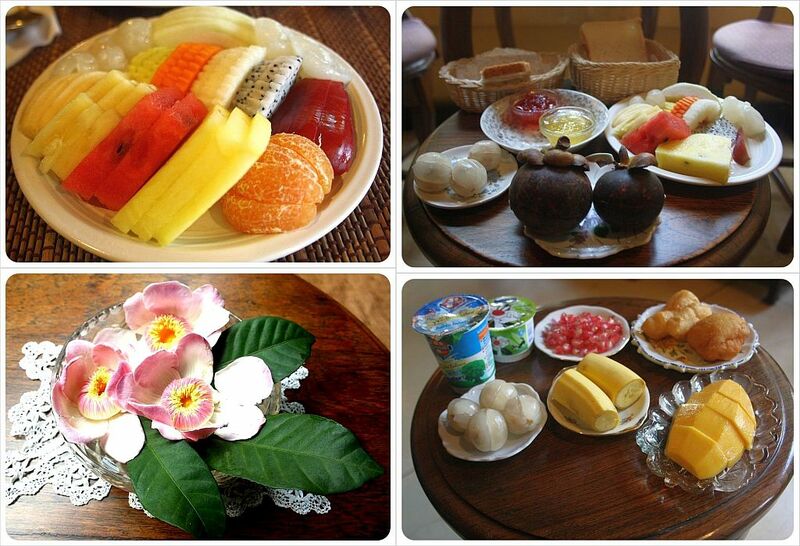 In addition to the choice of egg/meat/bread breakfasts, there is practically a buffet of exotic fruits – from small bananas and juicy mandarins to mangoes, pomegranate, mangosteens, Chinese pears, dragon fruit, and plenty of others we have seen but can’t name. One of the hotel owners, a polite older gentleman, even has a book with all the Thai fruits in order to show foreign guests just what they are eating and what it is called. As a side note, the eggs I order with my brown bread are also scrambled to perfection. Regardless as to whether guests are here for business or pleasure, free in-room wi-fi is simply a must in a capital city like Bangkok, especially considering there was perfectly good quality wi-fi in the main lobby. Why not just extend it to the whole hotel? There were at least four guests in addition to us forced to bring laptops down to sit at the tables and use the wi-fi. While the in-room internet connection on the computer was a nice touch, our computers and smartphones are packed with personal information not available on a generic hotel computer – from work-related materials for business travelers, to travel info, tour guides and personal emails for holidaymakers. For some reason, mattresses in Thailand tend to be rock hard, but my bed was more unforgiving than most. On the other hand, Dani had a great night’s sleep in her single bed. There are hundreds of hotels in this middle price range in Bangkok and the quality varies extremely between the best and the worst rip-offs. What we enjoyed so much about the Old Bangkok Inn is the value for money: clean, well-decorated rooms, traditional Thai atmosphere, impeccable service and delicious breakfast – along with the total peace and quiet in the center of Bangkok’s busiest area. Welcome to our Hotel Tip of The Week series. Being on the road every day of the year means we stay in countless hotels, and at over 500 days as nomads, we have stayed some of the best (and worst) accommodation the world has to offer. We cover everything from budget to luxury accommodation, and believe that any hotel worth recommending must be comfortable and clean, offer good value for money and treat people as guests, not clients. We have personally stayed in every hotel we recommend to you here on Globetrottergirls.com. Dani had surprised me with a week-long holiday on the island of Ko Lanta as a birthday gift back in September. When we finally arrived on the island over a month later, our need for a relaxing week was desperate – Bangkok had been a bust and bus rides were bouncy and long. From the moment we stepped out of the shuttle bus at Chaw-Ka-Cher Tropicana Lanta Resort, however, we knew we were in good hands. Two of the nicest (and tiniest) men scooted out to grab our dusty backpacks, and we were escorted to the relaxing reception area where we were served a glass of cool sweet tea and given warm hand towels while we checked in. Any negative feelings quickly evaporated as we walked through the villa through tropical plants and past a pair of lazy kittens soaking up sun on the front steps of empty bungalows. It was the end of low season, and of the 24 cabins that make up the resort, only a few were occupied at any given time. We shut the sliding glass doors to our poolside bungalow and felt true peace and quiet envelope us for the first time in over a week. The design was stylish, the contrast of white flowing curtains and deep brown wood was comforting. The spacious room had plenty of windows and glass doors which let in loads of natural light. As requested, we were given a bungalow with a king-size bed (unlike our usual adventures with two single beds) and fluffy pillows. The nightly turn-down service included beautiful tropical flowers and was a really special touch. The room’s showcase, however, was outside – the outdoor bathroom. Chaw-Ka-Cher is a small off-beach resort with only the 24 villas, a relaxing pool/jacuzzi area (see more in ‘Stand-Out Feature section) and the breezy restaurant/reception nearer to the road. Open to the public for lunch and dinner, breakfast (included in the room rate) is reserved for guests. Each morning, a table is laid out with locally-baked bread (white/wheat) for you to toast to your liking, plus cut-up fresh fruit, interesting Thai sweets, tea and coffee. At our table, we were served carafes of pineapple and orange juice while choosing a main dish off the breakfast menu: pancakes, french toast, eggs and ham or a traditional Thai rice soup. In the main building, the hotel website boasts a library, an internet cafe and meeting rooms, but in reality there are a few bookshelves and three computers, and while there were rumors of in-room wi-fi, several guests with laptops joined us in the restaurant, the only spot with a wi-fi connection. The always-smiling staff went above and beyond to make sure we had what we needed each day (although English was limited) and by the end of our week on the island, they bade us a friendly farewell. Ko Lanta is large and spread out, with the main population clustered around three main beach areas. One (Klong Khon Beach) is within easy walking distance. The rest of the island is best reached by motorbike and if you know how to drive one, the hotel rents several for $6 a day. For the rest of us, there are plenty of tuk-tuks to hop in and get round the island no problem. The resort also offers a very handy, free shuttle service at 11am daily, which brings you right in to Saladan (the town on the northern tip of the island), where there is a grocery store, banks, restaurants and all the tourist trinkets you could ever want. You’ll have to hop in a tuk-tuk to get back. The hotel also offers a full listing of massage services, which can be taken poolside or on your own front porch. Whether we were floating on our backs looking up at the jungle canopy or lounging on deck chairs listening to the chirping birds, the pool was the most relaxing area of the hotel. The jacuzzi wasn’t running during our stay, but we can only imagine that during high season when the resort is in full swing, this would be another great place to relax. Thai cuisine is traditionally rich with vegetarian options, so the lack of veggie food – both Western and Thai – available on the menu was disappointing. Restaurants and bars are all a good away, which means that, especially at night, we would have eaten on-site on several occasions had there been vegetarian options on the menu. Ko Lanta has managed the influx of tourism much better than neighboring (tourist-traps) islands of Phuket and Koh Phi Phi, retaining an almost undiscovered feel in comparison. Located off the beach and in between town makes Chaw-Ka-Cher feel ever more secluded, and the peaceful setting and rustic charm of the hotel makes this an affordable, yet indulgent escape. Like this hotel? Book it here. 3. La Candelaria, Valladolid, Mexico Budget – one of our Top Picks!